One of the issues raised about ranked-choice voting by U.S. Rep. Bruce Poliquin is misplaced. Those voters also cast fewer blank ballots in the ranked-choice election for U.S. Senate — which incumbent Sen. Angus King, an independent, won easily — than they did in the gubernatorial race, which lacked the option of ranking candidates. The bottom line, Richie said, is that the numbers show that ranked-choice voting races “drew more votes than what likely would have happened” without the new voting system. The Republican has also filed a federal lawsuit in a bid to have the state’s ranked-choice voting system ruled unconstitutional, perhaps leading to a new election. Goodman said the ranked-choice voting “manipulations that produced this faux majority violated the Equal Protection, Due Process, and the Voting Rights Act” and underlay his argument that the court ought to reject Golden’s victory. 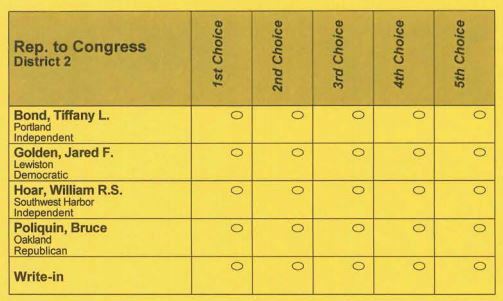 Sample ballot from the Maine 2nd District congressional race this year.